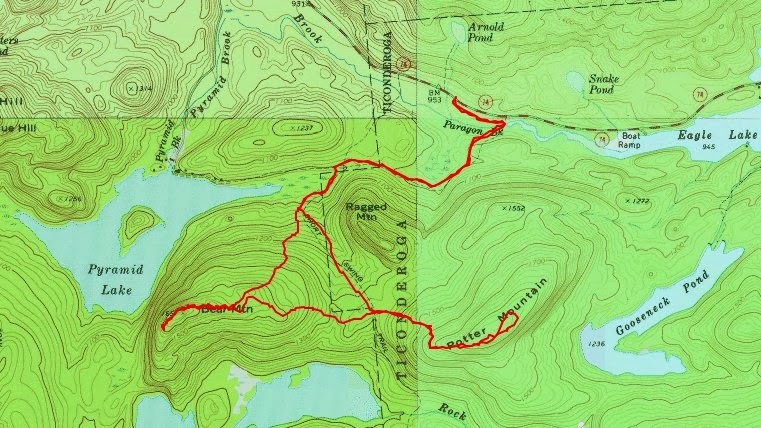 Plan A for Sunday was to attempt to climb Hoffman Mountain in the Hoffman Wilderness via the Big Pond Trail from the south. The extreme cold wind chill caused me to reconsider. Hoffman is a long bushwhack and I decided I should save it for a day with no severe weather. What I decided to do instead was hike from Upper Works to Flowed Lands to check on my adopted lean-to at Herbert Brook. 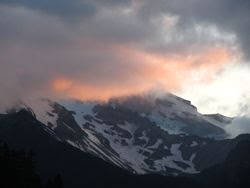 I would also possible do a little exploratory hiking in the vicinity of Calamity Mountain. I arrived at Upper Works at 9 AM and expected the parking lot to be at least half full. I was surprised to find only one car that had just arrived. Just getting out of the car was a couple that were headed for Mount Marshall. While they were getting there gear together, Rev and I headed down the trail. It was -4 degrees F but the wind didn't feel bad at all. We moved briskly to stay warm and we reached Calamity Pond and the David Henderson monument in an hour and 15 minutes. At this point, I decided to explore the area around Calamity Mountain and headed east towards the northern shoulder of the Calamity Mountain ridge. The going was tough. The trees were dense and the blowdown made it slow going. I did get some glimpses of the McIntyre range. My toes started to get cold because I wasn't moving very fast. The true summit of Calamity would be saved for another day. I made my way back to the Calamity Brook Trail, shook myself off and continued on to Flowed Lands. The ice was solid so Rev and I made our way across. When we reached the Opalescent River, I wasn't so sure about crossing it. There was broken up ice that had refroze. I could see the remains of tracks crossing the river, but I wasn't comfortable with the feel of the ice so I turned back to take the trail around Flowed Lands. While I was on the trail around Flowed Lands, I noticed I had lost one of my Hillsound Trail Crampons. I backtracked a few minutes, but didn't see it. I never did locatedit so it probably came off while I was bushwhacking. I'll do my best to locate it on another trip. Soon I was at the Herbert Brook lean-to. Things looked good at the lean-to. The sun was doing it's best to warm the area. It felt nice. Rev... perhaps wanting to climb Colden? Next, Rev and I walked around the southern end of Flowed Lands to the Opalescent lean-to and the Griffin lean-to. The person I saw out on the trails all day was a DEC person (Jim) heading for the Interior Outpost at Lake Colden to spend 5 days in residence there. I want that job! It was now 1:30 and clouds were quickly coming in, as was forecast. Rev and I watched the changing skies as we made our way back around Flowed Lands. I'm always sad to be heading away from this area, it's just a magical place. 3:30 found us back at the car and headed home ending another weekend in the ADK's. 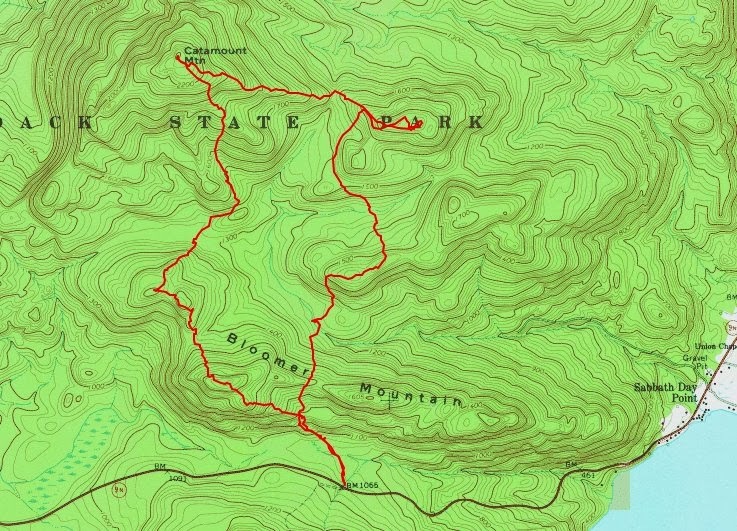 One of the things I have done as I've hiked in the Adirondacks is to highlight trails on my maps after I've hiked them. 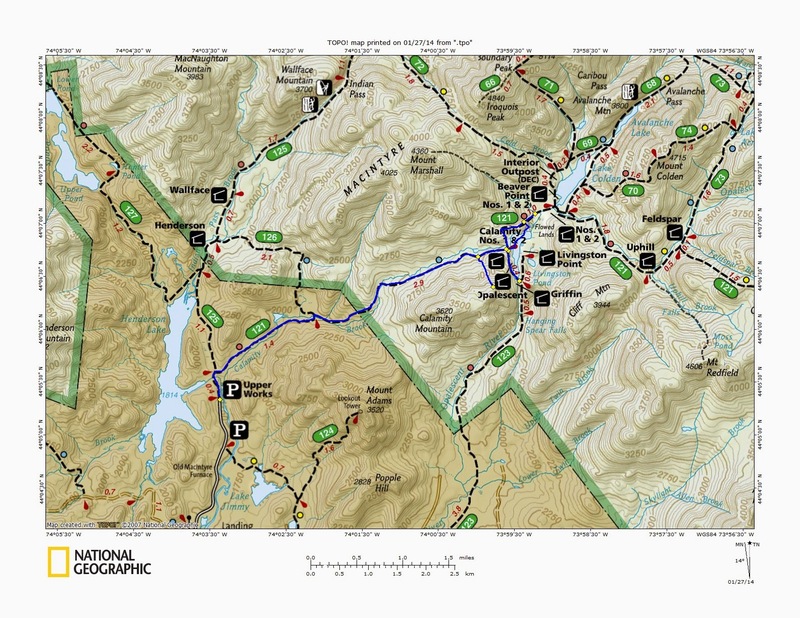 Sometimes when I'm choosing a new hike, I pull out these maps and look to see what trails I haven't hiked yet. That was the case on this snowy Saturday. I didn't want to drive too far and I looked to see what was close by that I hadn't done. 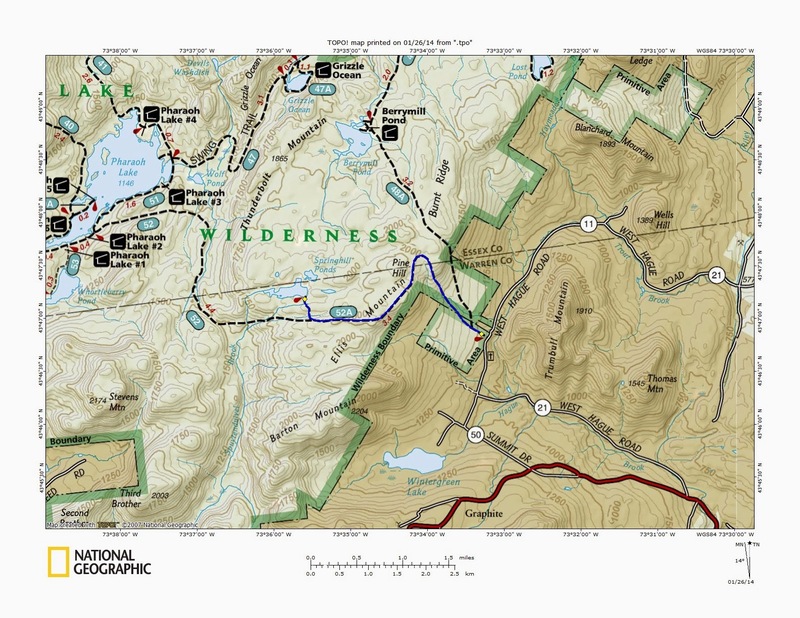 The Springhill Ponds trail lies at the eastern end of the Pharaoh Lakes Wilderness. The trailhead is at a small parking lot on West Hague Road. Leesa and I chose to hike this trail, knowing that with the snow coming down, we wouldn't have any visibility. In fact, the weather was almost identical to my hike the previous weekend to Catamount Mountain in the Lake George Wild Forest. This trail shares a trailhead with the Berrymill Pond Trail. At approximately 1/4 mile the two trails split with the Springhill Pond trail going left and the Berrymill Pond trail going right. Soon afterwards, the Springhill Pond trail begins a relatively gradual 800 foot climb. This trail is ski-able for an intermediate level skier. There were a couple trees down that a skier would have to go around, otherwise the trail is fine. 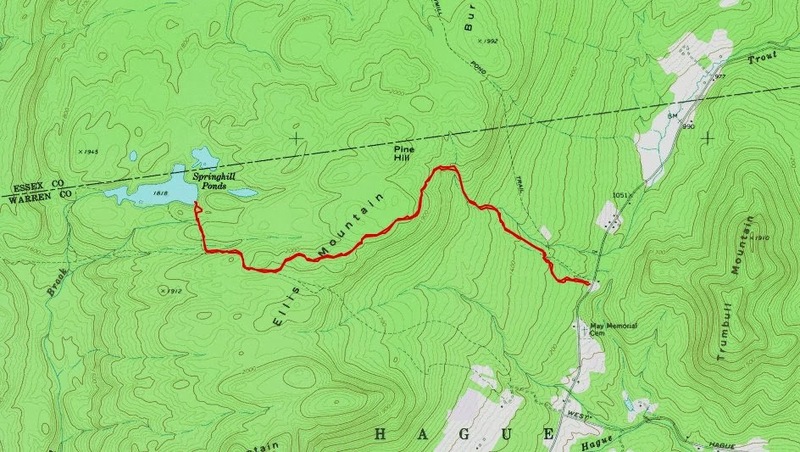 After the 800' climb, the trail follows the southern ridge of Ellis Mountain. Along this ridge, we were exposed to some wind which quickly blew snow into our tracks after we passed through. Although the ridge held some sparse conifers, most of this trail goes through hardwood forest. The trail at various points follows an old woods road and signs redirect hikers at two different locations. Springhill Pond is reached via a spur trail which unfortunately is not signed. It is somewhat obvious, but can be missed if you are not watching the surroundings. The spur does have red trail markers. It is a short spur of less than 1/2 mile. We reached the water's edge to find a snow covered canoe. The pond of course was covered by snow and ice. We did not walk out onto the ice, but stood and took a few pictures. It's hard to envision what this pond would look like in the summer when seen covered in white. Still, it's nice to get out for a walk on a snowy day. One hike for me often leads to another. In this case, I had hiked to Gooseneck Pond in the Pharaoh Lakes Wilderness Area back in December and while there, I spent some time eyeing Potter Mountain. It appeared to boast a long open ridge that without a doubt, offered views back down to where I was at Gooseneck Pond. The first thing I did when I got back home was to add a trip to Potter Mountain to my future hike list. On this day, Leesa, Rev and I got an 8:30 start from the Long Swing Trail on Route 74 near Chilson. It was snowing lightly and there wasn't much visibility, but we were hoping it would clear. It was about 20 degrees. We followed the Long Swing Trail for 1.5 miles before branching left to begin our bushwhack towards Potter Mountain. The woods were open and the ground conditions were fine for microspikes. There was only 1-3 inches of snow on the ground throughout the hike. We were angling towards the southwest edge of Potter Mountain. As we approached the ridgeline, we were greeted by a thick forest saplings. We skirted around the SW corner of the ridge in hopes of bypassing the saplings. We had to wade through a small area but as we got around to the SE edge of the ridge it opened up and the saplings were mostly gone. It appears that perhaps most of this ridge was perhaps devastated by fire at some time in the past. With an open eastern ridge, and a faint herd path, it was an easy walk to the true summit. I can't think of another summit that has such a long open summit. I was anxious to get a look down to Gooseneck Pond, and I wasn't disappointed. As we reached the midpoint of the ridge on the east side, we were rewarded with a great view down to Gooseneck. I could also see Peaked Hill, which I had climbed in December on the day I bushwhacked to Gooseneck Pond. The snow had stopped, giving us a little bit better visibility. The sun was trying to come out, but it wasn't quite there yet. I want to come back to this peak in the summertime to see what this summit looks like then. We made out way back down to the Long Swing Trail the same way we came up. Once back to the trail, we decided we had enough time to head west and climb Bear Mountain as well. Bear is an easy climb from the east. It feels like just a gradual hill. Once again the walking was easy. Blue skies made their arrival! Just as we reached the final rock ledge at the summit, we came across a lightly used path and then saw several small discs that said PLC which I knew were the Pyramid Life Center. Apparently we were on private property and didn't know it. There were no posted signs, but I should have known better. It was time for us to head back anyways so we bushwhacked back towards the Long Swing Trail. We happened to get back to the trail right near where we had begun out bushwhack to Potter Mountain. From there it was an easy 30 minute walk back to the car. Just in time to get home for the NFL Championship games.